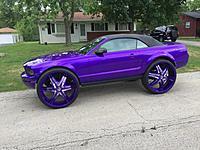 What Kind of Mustang Can You Get for a Grand? As it turns out, you can get a Mustang for a grand that isn't horrible. And slow but sure you can bring it back to life. Fix the items that have to be done, then a paintjob. Now your at a good looking car. After that start mods. But keep in mind the engine is getting close to its end. $2,000 for a rebuilt one with installation. I don't think its a bad deal, bring it back from its end to a nice running 1993.